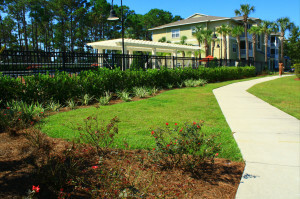 Commercial landscapes aren’t a “set it and forget it” business investment; they require constant care and maintenance. That’s why GreenEarth’s services don’t stop at commercial landscape installation. After we complete your property’s initial design and construction, we’ll stay with you year round to help you care for it as long as you need us. We offer a full spectrum of commercial landscape maintenance services, and have care and maintenance services to suit every need — and every budget! After the first phase of your commercial landscape is complete, your dedicated account manager will stay in regular contact with you, including a detailed quarterly CARE call to discuss your property’s progress, needs and areas of concern. What’s a CARE call? It stands for Customer Assurance Review Evaluation, and it’s key to our proactive customer service approach — and the continued satisfaction of you and all our customers. And, of course, our commercial landscape maintenance crews will ensure that your grounds are impeccably maintained. We offer regular mowing, edging, pruning and other services, as well as special services to add that extra touch for a special event. Commercial landscapes are living things, and we’ll ensure that your grounds age gracefully as plants become more established and your maintenance needs continue to evolve. All of us at GreenEarth Landscape Services, from our office staff to the crews who are hard at work every day, treat every client’s landscape as we would our own, professionally and with respect for the landscape and people who will enjoy it long after we leave. You’ll feel the same pride we do — we guarantee it. Contact us today to start the discussion about your commercial landscape design, construction and maintenance. Already have a commercial landscape in place? We’d love to talk with you about establishing a maintenance plan. You can reach our Panama City Beach office at(850) 236-1959 or our Santa Rosa Beach office at (850) 267-0010. Or, you can fill out our handy online form to schedule a free consultation.